It is has just been one of those days. I finally got a moment to sit down and post and it’s already 9pm. Actually, anyone who knows me well will be totally surprised that I am even attempting to string any words together on a page at this time of night. Most evenings, this is my bedtime. Occasionally I make until 10, but generally speaking I am completely out and dead to the world by 9 or shortly after. Really you say? Oh, yeah, after teaching between 40 and 50 kindergarteners all day, making the commute home across the city, cooking dinner, tidying, running the kids’ to their activities, refereeing the sibling rivalry matches and dodging my hormonal daughter’s “bullets”, I am done by about 7, but somehow manage to hang in there until 9. I try to blog ahead and post date if I can, but not this week. I was recovering from parent teacher interviews over the weekend and just didn’t have the energy to spend hours at the computer. So, this week, I am trying to fit my blogging into my already crazy schedule. Note to self….this doesn’t work well. Anyways, the good news is that today was my day off and I managed to try two new recipes. I had “pinned” this recipe months ago, and finally decided to try it out. Of course, we were all going in different directions at supper time, so I don’t even know if my husband enjoyed the meal as much as Shay and I did or not. We both loved it! Eden refused to eat it because it was “green”. Eventually, she did eat half of an enchilada, but that was only because I told her she would get nothing else to eat unless she ate some supper. She said it wasn’t bad and apologized for not giving it a chance. She certainly didn’t rave about it, but I think they’d have to be smothered in chocolate sauce to get her stamp of approval these days. All of a sudden, she is very picky – ugh!! This recipe was posted by The Holzmanns, but she offers credit to Give Me Some Oven as the original poster. These enchiladas are different from any I have tasted before. I was totally intrigued when I first found the recipe ~ I couldn’t wait to see how so many of my favourites were all brought together in such a unique way. 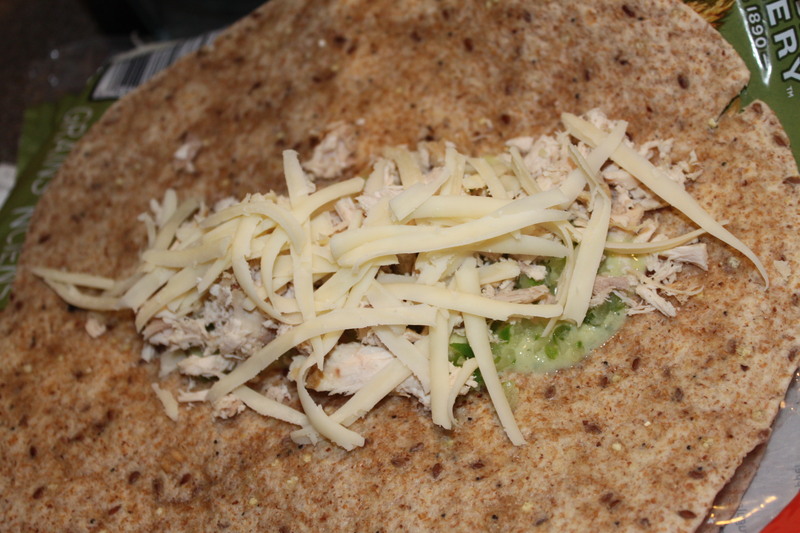 Mmmm….cilantro, lime, avocado, chicken….what could be better. These almost have a “fresh” springy flavour – very different. Creamy, yet light and oh so yummy. I wouldn’t change a thing. I used the rotisserie chicken like Hannah recommended and from start to finish it took me about an hour and a half to have them ready to serve. Prep took almost an hour. Next time, I will follow Hannah’s lead and make a double batch, so I can freeze on pan for a future meal. I didn’t want to do this on the first go around in case they didn’t pass the family test. Melt the butter in a skillet over medium high heat. Add the flour, whisking until golden and bubbly, about 2-3 minutes. Slowly whisk the broth into the flour mixture. Bring to a boil, then reduce heat to medium-low and simmer for 5 minutes. Stir in the sour cream, cumin, salt, garlic powder and pepper, whisking if necessary to remove any lumps. Season with additional salt or pepper if needed. In a large skillet, heat olive oil over medium-high heat. Add onion, poblano and jalapeno, and saute for 5-6 minutes until the onions are cooked and translucent. To assemble the enchiladas, place a tortilla on a flat surface. 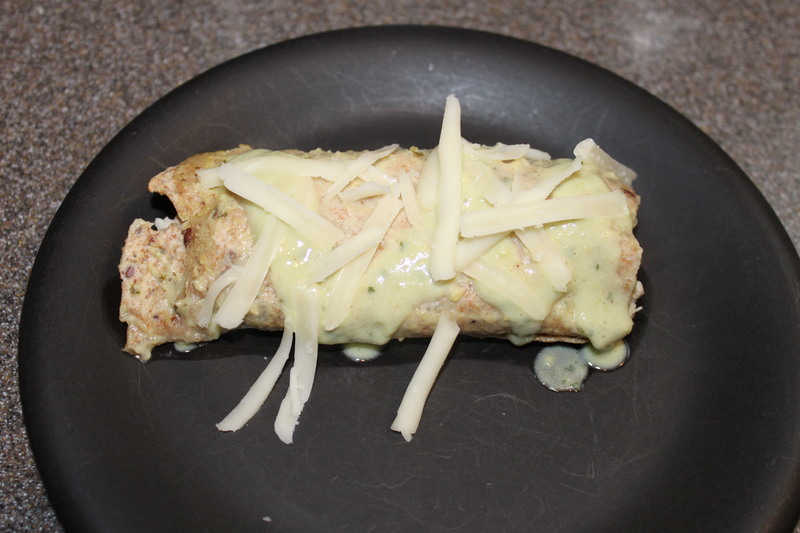 Spread a tablespoon or two of the avocado sauce down the middle of the tortilla. 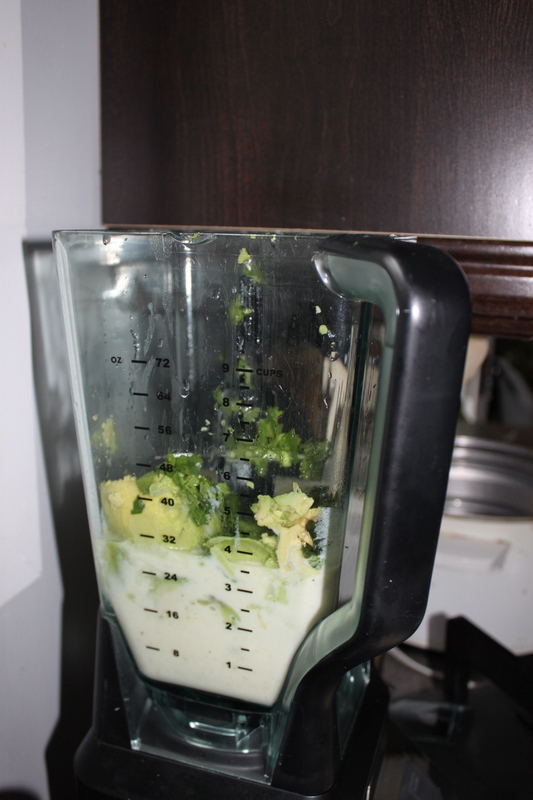 Then layer on some of the vegetable mixture, shredded chicken and cheese. Carefully roll the tortilla and place it seam side down in the baking dish. Drizzle the top with about half of the remaining avocado cream sauce, then cover the dish with foil and bake for about 20 minutes, or until tortillas are heated through and begin to harden. I literally popped these out of the oven 4 minutes before we had to leave for hockey practise. No time to take photos, here is a quick snap shot of the half I managed to scarf down before racing out the door! Delicious. Posted on October 22, 2013 by Cindy Roy •	This entry was posted in Main Course, Recipes and tagged avocado recipes, chicken enchiladas, chicken enchiladas with avocado cream sauce, chicken recipes, enchilada recipes, main course, make ahead meals, Mexican recipes. Bookmark the permalink.